I'm a huge believer in the fact that music today just isn't what it used to be. I absolutely love old music and will listen to it over Top 40 stuff anyday (with the exception of One Direction of course). Old music just makes me feel something that new music doesn't. Somewhere in all the cheesiness and angst and amazing guitar riffs, they nailed something that just isn't around much anymore and I absolutely love it. I love knowing that this is what my parents listened to and picturing myself like I'm living in a John Hughes film with my own personal Blane a la Pretty in Pink. Since you got a glimpse of my dorm yesterday, now you can get a peak at what I'm listening to when I'm hanging out here or driving home on the weekends. You're 100% more likely to catch me listening to Billy Joel or Boston over Beyonce. #sorrynotsorry So grab your scrunchie, pop in your headphones, hit shuffle, and be the best Carrie Bradshaw you can be. P.S. - not all of these are "vintage," but they've got a vintage feel to them, so I've counted them in. 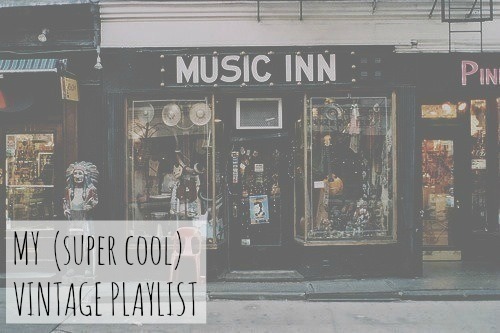 Literally my music taste summed up in one playlist - perfect!!! I'm obsessed with it! It's been on constant repeat. I'm loving Noah and the Whale, btw! I actually don't have a clue about popular modern music and I really don't care to I will be honest. The only modern music I listen to is in the metal genre. Everything else is 1980's and earlier, it helps having over 800 vintage, original vinyls to feed that preference! I will pretty much listen to anything but metal, but having so many records (especially originals) is awesome! I'd love it! LOVE so many of these! Love all of these bands! So happy you are listening to amazing music.